We are Warrington's friendliest photographic society and meet throughout the year, every other Monday. Most meetings start at 7.30pm at The Studio, Bellhouse GYCA, ending in the attached CAMRA awarded bar from 9.30pm. New members and photographic subjects always welcome. Tel Chris on 653244 or from our contact page. Free to come along and see if the group is for you! 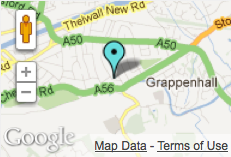 Grappenhall based Website Designer - Designed Grappenhall Library and many other local websites! We are now open EVERY DAY from 1.00p.m. to 4.00p.m. and a guided tour is available on request on Sundays at 2.00 p.m. Entrance is free.